The Dow Transports have historically been considered a good leading indicator of the global economy given that the companies in the group are responsible for moving goods across the country. While we wouldn’t completely dismiss the Dow Transports as an economic barometer, as the economy has migrated away from manufacturing over the years, the sector’s relevance has declined. In an interview earlier this week, we argued that because semiconductors are central to every aspect of the globally connected economy and even to many analog aspects of the economy, they could be considered the 21st century equivalent of the Dow Transports. Every investor is entitled to their opinion of whether the Transports still carry the same weight as they have in the past as an economic or market barometer, or if the Semiconductor group has the same sort of relevance. One thing everyone can agree on, however, is that right now the sectors are telling two very different stories. The chart below compares the relative strength of the S&P 500 Semiconductor Group and the Dow Transports to the S&P 500. For each chart, a rising line indicates outperformance versus the S&P 500, while a falling line indicates that the S&P 500 is outperforming. From last March right up through the later stages of 2018, both sectors saw their relative performance versus the S&P 500 decline. Beginning in November, though, semis began to turn things around while the Transports have continued to lag, and in recent weeks their performances couldn’t be more opposite. 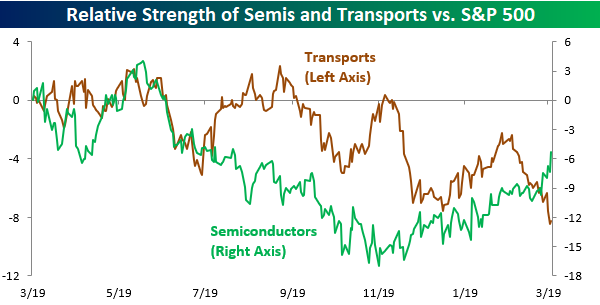 Just today, the semis are trading at their best levels since early October while the Transports are still trending lower. Only time will tell which sector is giving a more accurate picture of the economic backdrop, but semis have had more recent history on their side. Fed dovish talk sinking mortgage rates, i wish i was in the market for a house right now lol. LABU has me worried there for the past couple days, thought we were going to see a waterfall, XBI held up pretty well, reclaiming the 8 EMA. so LABU is still a hold for me. wish i had stayed in TWLO, took profits on that last week. Can anybody give me your favorite us stock? Good Friday morning to all. Hope everyone has a good trading day ahead on this final trading day of the week. 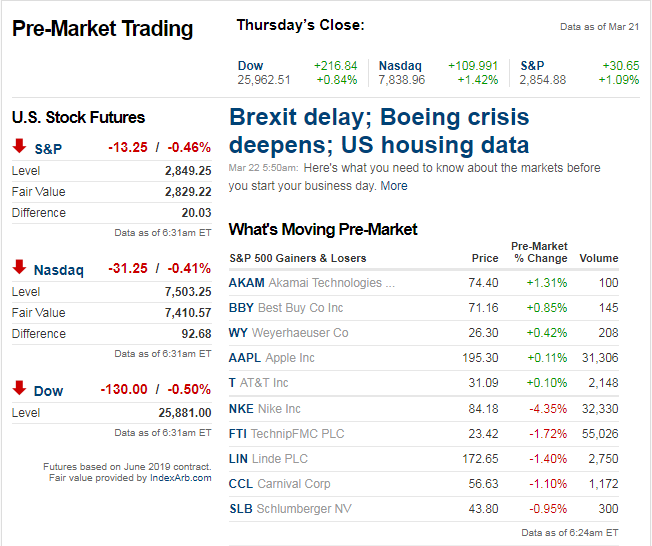 Investors are scrambling for fixed income this morning after some truly bad economic data in Europe. 10-year bunds are back to negative yields and the US Treasury yield curve (10y vs 3m) is just 2 basis points (bps) from inversion. As you might expect, equity futures aren’t taking too kindly to the moves in fixed income and are looking to close out the week on a down note. 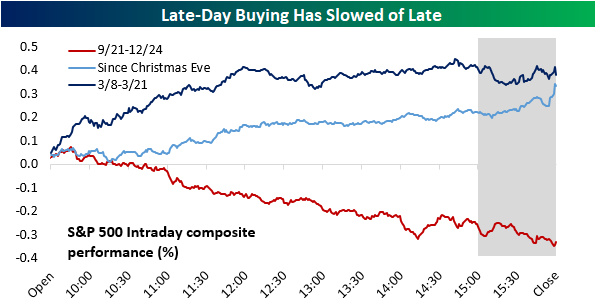 As noted in our Closer report last night, one of the defining characteristics of the rally off the Christmas Eve lows for the stock market was the trend of strong buying in the last hour of trading and right into the closing bell (light blue line), which is generally considered a positive market signal. That strength stood in stark contrast to the period from 9/21 through 12/24, where the S&P 500 typically sold off towards the close (red line). Over the last two weeks, late day buying power has started to weaken (dark blue line). Up to this point, we haven’t seen it turn outright negative, but it has shifted to a more neutral trend and something that bears watching in the weeks ahead. Lets see if the ma(9) on the daily holds here, could be a long entry. A couple days ago I saw the calculation was 14% chance of a rate cut in the next year. Currently 10-year rate is 2.44%, it was 2.60% a couple days ago. How close is the inversion? I think the definitive one is 2yr/30yr. There's an inversion/flatness in the 6mo/7yr. Well looks like the weak data from Europe and the not so good data here in the US today really spooked the market today 1 year yields now at 2.449% and the 10 year at 2.448%. well that escalated quickly lol. key support level in LABU broke earlier in the day so i got out of it. then after like 2pm things got interesting, picked LABU back up when i saw xbi hit the 21 ema. and also got in some ROKU. i see the SPX held the 2800...barely. if the sell off continues monday ill just get back out. but i figured it was worth the risk.